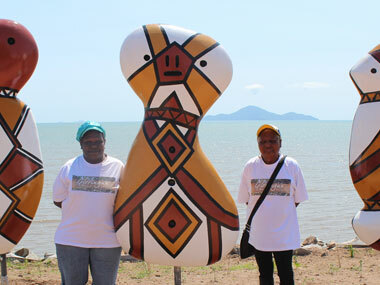 Three large bagu are now permanently installed on the Cardwell Foreshore at the southern end of town. The three imposing sculptures stand like sentinels against the backdrop of Rockingham Bay and Hinchinbrook Island and realise a long held desire by Traditional Owners to publicly demonstrate the uniqueness and vitality of Rainforest culture for all to see. Based on the bagu designs of Eileen Tep and Charlotte Beeron, both artists represented by the Girringun Aboriginal Art Centre, these bagu were inspired by the traditional fire-making tools of the rainforest people of North Queensland. Placed so that they look out to sea and back inland they conjure up a different time and way of living. A time when life and the tools of life were inter-dependant with the environment and the resources it provided. Taught by her mother and father, Eileen Tep continues to make Bagu in the traditional manner as well as the more contemporary works. Created over a two month period from original designs by Eileen and Charlotte, the bagu were adapted to fibreglass by a specialist mould maker and then hand-painted by Eileen and Charlotte. Suspended upside down to enable all round access, painting the larger than life size bagu proved to be a challenge for both artists. “It was difficult for us but by the time we got to the last one we knew what we were doing,” Charlotte Beeron said. “We were learning as we were doing it. These were made from different material to what we normally use and we didn’t know how to work with it in the beginning. The Bagu sculptures are about history, the past and the present. They represent a culture which is alive and engaging with new ideas, always with a strong connection to tradition. This Girringun Aboriginal Art Centre project was financed by the Cassowary Coast Regional Council as part of the Cardwell Foreshore Recovery Program. Girringun Aboriginal Art Centre in Cardwell.